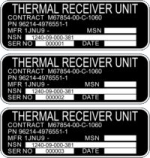 Custom Aluminum Labels Printers | Save with Top Rated US Aluminum Label Maker | Data Graphics Inc. Custom Aluminum Labels Printers | Save with Top Rated US Aluminum Label Maker | Data Graphics Inc. 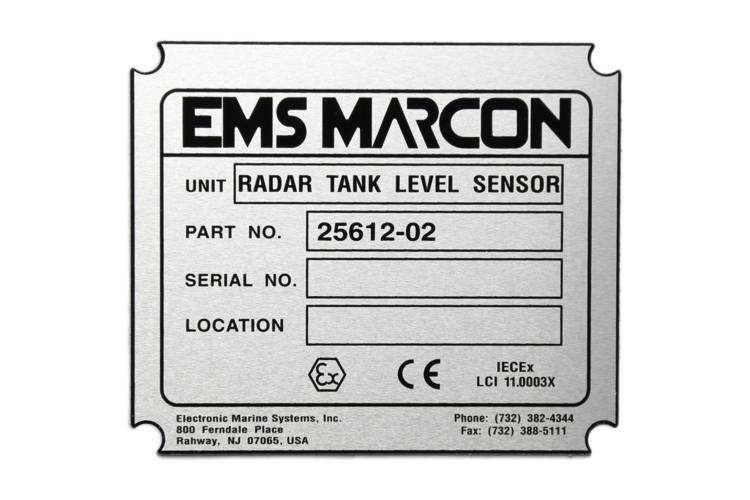 When you need an ID plate or label proven to stand up to the harshest conditions, anodized aluminum labels are the solution you need. 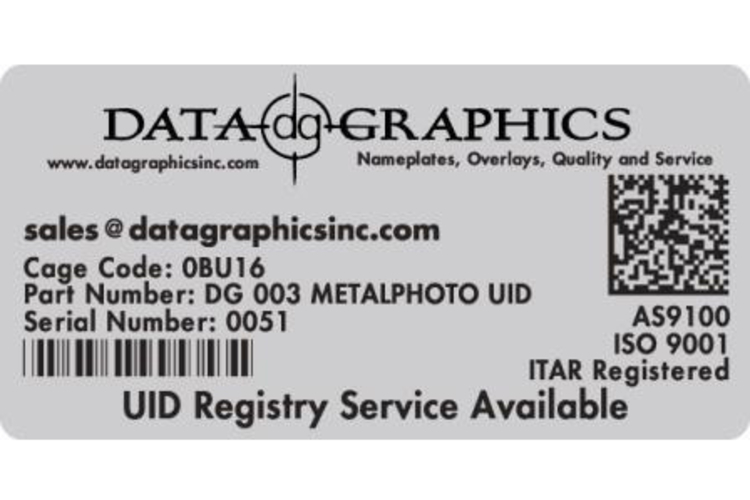 As an award-winning, UL, ITAR, ISO 9001, and AS 9100 certified aluminum label maker, Data Graphics may well be the aluminum label printer you are looking for. 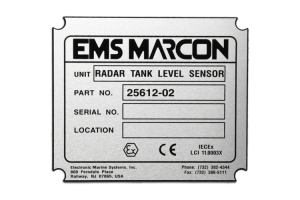 Heavy equipment manufacturers, the aerospace, medical, manufacturing, military and telecommunications industries, and all five branches of the military trust our reliable products, especially our custom aluminum labels. In truth, custom aluminum labels can be used in almost any environment, and for most applications, since they are rugged, lightweight, and weather the elements so well. 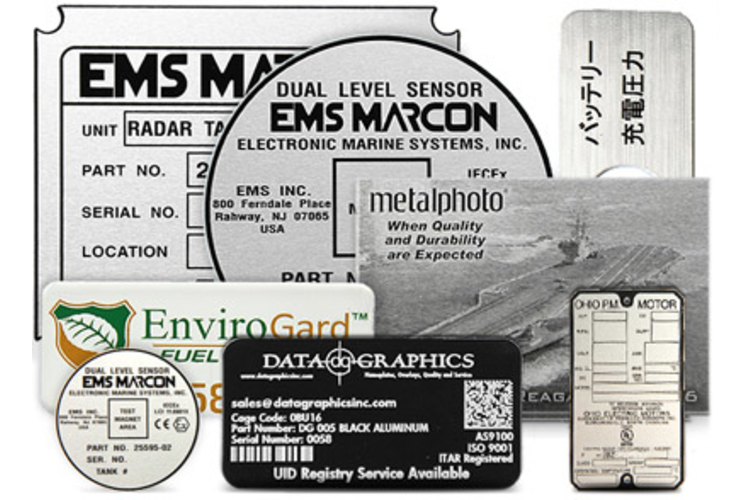 Why Choose Data Graphics as your Custom Aluminum Label Maker? Speed – Call 800-639-4316 now for a free quote to see how fast our process is. We are an industry leader in custom aluminum label manufacturing, with turn-around times of 2-10 working days. Remarkably, more than 60% of our aluminum/metal labels are shipped ahead of time. Problem Solvers – Our staff is extremely knowledgeable, helpful, and experienced, with literally hundreds of years of collective experience. Our sales engineers are the friendliest and most genuinely helpful of any aluminum label maker in the nation. We know how to solve aluminum label printer problems, and do whatever it takes to help our clients’ solve theirs. You won’t find an aluminum label maker who you like working with as much as Data Graphics. Confidentiality – Data Graphics is an ITAR Registered (International Traffic in Arms Regulations Compliant) firm which adheres to the highest standards of security and confidentiality. 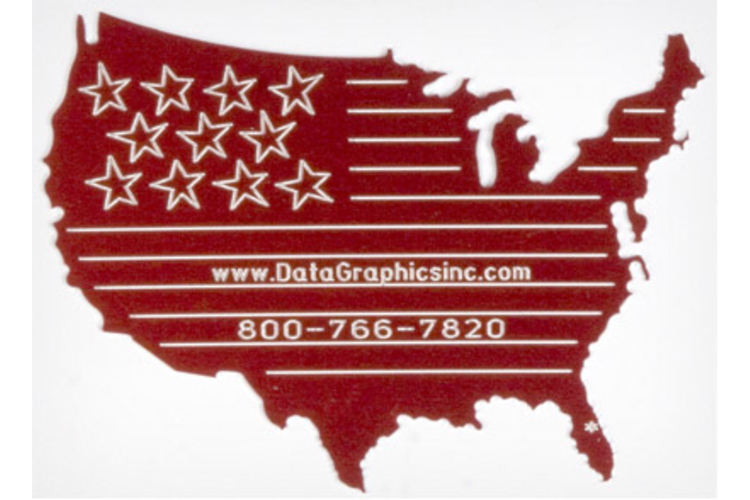 Size – Data Graphics is large enough to have many of the latest and greatest machines, which is extremely important when etching, engraving, or digitally printing custom aluminum labels. We also have redundancy, with multiple presses, laser etchers and CNC engraving mills. We are small enough, however, that our customers aren’t numbers, but valued clients. You won’t find an aluminum label printer as committed to your success. Getting it right the first time – Every step along the way our team double checks the work done prior to catch any errors. 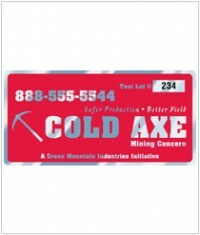 We know how important it is to get your custom aluminum tags done right and on time. 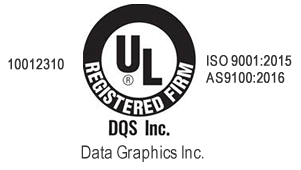 Trusted – Data Graphics has a hard-earned reputation to uphold as the nation’s top quality aluminum label maker. Our clients include Disney, NASA and Boeing, to name just a few. 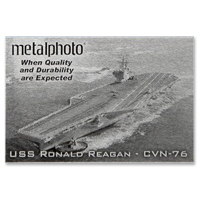 Each of the thousands of aluminum metal labels we create is manufactured to the same high standards as if it were going to be on the next submarine or fighter jet. Our standards are so high that more than four out of five customers repeat order with us. Excellence – Each member of our aluminum label maker team is…how shall we say it…a little OCD. I know it is hard to imagine being obsessive about labels and nameplates, but each aluminum label maker on our team is so committed to excellence that he or she catches the slightest errors in color, registration, etc. that most clients would never notice. That’s why we average 99% approved order rates. 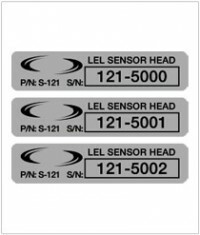 Anodized aluminum labels are designed to withstand the most extreme environmental conditions. We manufacture our custom aluminum labels to withstand the effects of sunlight, salt spray, high temperatures, cleaning solvents, chemicals, and abrasives. Unlike some materials, lightweight and functional anodized aluminum labels will not crack, chip or peel off over a long period of time. We can manufacture custom aluminum labels by die cutting them or machining them on our CNC to your specifications. Whether it’s a circle, square, oval or another custom shape, Data Graphics can create the design you want on your custom aluminum labels. We can even include rivet holes, custom cutouts, etc. Anodized aluminum labels can be affixed with any number of different adhesives, depending on the requirements of the conditions they face. Let our helpful, knowledgeable team help you find the best adhesives and printing methodology for your custom aluminum labels. Thickness is also a concern. It is difficult to find an aluminum label printer who can handle very thick or very thin substrate. We can machine custom aluminum labels ranging from .003 inches to .125 inches. The other challenge that many an aluminum label maker faces is printing. The cheapest and easiest options available to an aluminum label maker are rarely the best choices, and specialized equipment is required for many projects. Notice that we have not used the phrase “aluminum label printer.” That is because there are many possible ways for an aluminum label maker to transfer text or images onto your custom aluminum tags, and it is important to use the proper methodology. Screen Printing – This is the most common methodology used by a true aluminum label “printer.” If you are looking for the most vivid colors and a relatively simple design, screen printing may be the perfect choice. We color-match your labels precisely using standard or coated Pantone colors. We also have perhaps the best color technician in the industry heading up our team. If you need custom aluminum tags that will stay bright and vibrant for years to come, consider using our fade-resistant inks. These screen printed aluminum labels maintain their fantastic appearance for years. You can learn more about our custom screen printing process here. There are some limitations to screen printing, however. First, serialized, barcode, QR code and UID custom aluminum tags cannot be done on screen printed labels. Second, any reputable aluminum label printer will tell you that for fading, color gradient, extremely fine detail, and other color subtleties, there are better choices than screen printed aluminum labels. Finally, screen printed aluminum labels are susceptible to abrasion, saltwater, chemicals, wear and exposure to extreme elements. Laser Etching – Etching is technically printing at all, but a necessity for any top aluminum label printer. Our laser etching machine is one of the most high-tech and impressive machines in the plant. It is capable of handling literally thousands of custom aluminum tags per days, or tackling larger printed aluminum plates/ logos/signs. Laser etching uses a precise, computer guided laser to remove the top layer from anodized aluminum labels. The anodized aluminum labels materials themselves come in a wide variety of colors, including standard brushed aluminum. By removing the top, colored layer, the etched message can stand out very prominently, as well as having the inset. Using our laser etcher, these “printed” aluminum labels be easily configured for serialization, barcodes, QR codes or UID’s. These custom aluminum tags are incredibly durable, and these aluminum metal labels can withstand the harshest elements for decades. Engraving – We have a leading edge CNC (Computer Numerical Control) machine to handle all of our engraving. Engraving is the most durable of options any aluminum label printer can offer, and the Gravograph CNC is a technical marvel. Rather than using a laser to burn into the aluminum metal label, our Gravograph CNC machine uses tiny, high speed bits specifically designed for the task. It is like an incredibly high-speed, fully-automated, computer controlled super-router. The Gravograph can make lines as fine as 0.005 inches thick, and its accuracy is mind-blowing. Each CNC machine can handle literally thousands of custom aluminum tags per day, or tackle larger printed aluminum plates/ logos/signs. As the name implies, the CNC machine specializes serialization, barcode, QR code and UID “printed” aluminum labels. These custom aluminum tags are virtually impervious to abrasion, UV rays, chemicals, saltwater, heat, cold, and other elements, and will retain functionality as long as the anodized aluminum lasts. Data Graphics has been the aluminum label printer of choice for so many important firms for so long for several important reasons — we have unsurpassed quality and unrivaled customer service, and we can rush your custom printed aluminum labels faster than most anyone in the industry. We would love to help you with your custom printed aluminum labels. Please call us at 800-639-4316 and begin to discover the Data Graphics Difference.